Please click on the following link to access the Post-Convention Survey. Please also feel free to leave us a comment below. 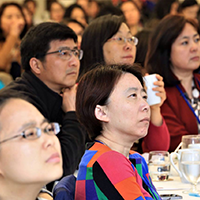 Thank you for joining us at 2018 Chinese American Convention! Based on the first UCA convention, I have no doubt the second convention would be equally successful if not more. It turned out to be even more successful. During the convention, I was surrounded and overwhelmed by the positive energy, the high spirit, the passion to serve, the wish to improve, the dedication to contribute, the desire to be united, the eagerness to brand our image. This convention is so impressive and inspirational. Way to go, team UCA! (2) Also kudos to program team for designing & tackling challenging topics. Wonderful Panelist. I hope we could be more focus instead of over ambitious. We need strong & commanding moderators & MC to keep audience focus & keep the flow when inappropriate interruption occurs. (3) Congressional visit is a great idea to advocate a national agenda for all Chinese Americans. However, we need to equip the civic /community leaders (AKA:: foot soldiers) with appropriate tools (focused talking point) and training (advocacy from non profits – dos & don’ts). Making appointments well in advance & keeping it all professional is very important (on time and to the point). Don’t turn it into multiple agenda from different people or just a photo opt with no follow up. Otherwise, the visits will become a dis-service to the Chinese American Community. 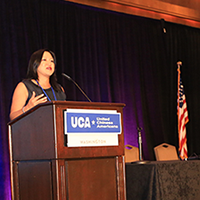 Last but not least, its so important to maintain non & bi-partisan in presenting politicians at the congressional reception (no matter how UCA’s leadership’s preference of personal political views). The dangerous is you will be labeled as voice of ONE party. Its detrimental even if its only a perception by the public. then, you will find it more difficulty to have genuine participation by other parties as speakers as well as attendees for they don’t want to be label too. I am glad we are uniting together to show mainstream America that we are here to stay and we are a part of the American Dream. We will not be quiet but will voice out our feelings and thoughts on how to improve this country for the betterment of every citizen. We know it will not be easy as I believe there are plenty of outside oppositions to our group. But with diligence and determination, we can fight for what this country stands for: Liberty and Justice for all. Hope we will be successful and our voices will not only be heard but will be respected and implemented. Our desired actions will make differences here in this great Nation and the entire world. Thanks to all the organizers and volunteers, you all did wonderful jobs! A couple of points that may have room to improve: 1 if the feedback form above can be filled online from cell phone, it is easier for people to give feed back. 2. The entance fee for regular audience can be lower to attract more people, the fee for business can be higher. 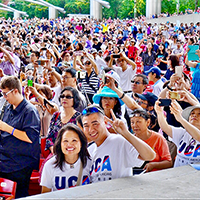 Given the limited resources UCA has (money, manpower, outreach to all Chinese Americans), the second convention is a great success. To get the next convention to the next level, we need to have 10 times more resources – 10 times fundraising, 10 times organizers including some professional planners, and 10 times grassroot organizations sending delegates to the convention.